This material was produced by İstanbul Bilgi University Human Rights Law Research Center in partnership with Human European Consultancy (HEC) and the Migration Policy Group (MPG). National Context Material is produced in the framework of the project Awareness raising in the areas of non-discrimination and equality targeted at civil society organizations managed by Human European Consultancy (HEC) in partnership with the Migration Policy Group (MPG) supported by the European Union’s Programme for Employment and Social Solidarity (PROGRESS). İstanbul Bilgi University Human Rights Law Research Center is designated as the local project partner in Turkey. Within the framework of the project a training material with title “Training Manual on Discrimination” was prepared and translated into Turkish along other European languages. National Context Material aims to demonstrate the current state in Turkey in the realm of non-discrimination and equality with regard to themes and modules covered in the training manual. 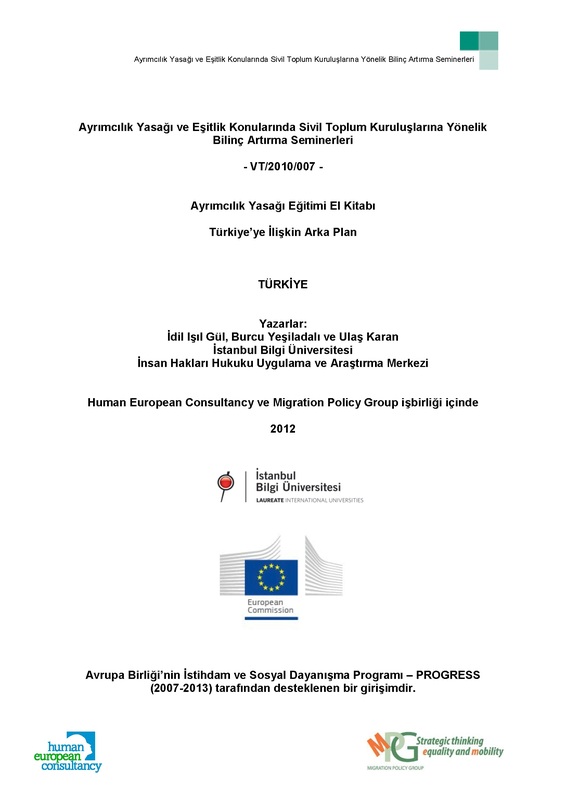 This report is prepared by İdil Işıl Gül, Burcu Yeşiladalı and Ulaş Karan who took part in the project as experts. National Context Material is available only in Turkish.